Horse owners usually have a lot invested in their animals, both financially and emotionally, and they want their horses to be as healthy as possible. Keeping with a horse’s veterinary and farrier visits, vaccinations and medical records can be a lot to manage. Here are five tips from HorseChannel.com to keeping your horses happy and healthy. An easy way to keep an eye on your horse’s health is to monitor its weight. Measuring weight with a weight tape is a fast and easy process that can help to identify a potential problem. This information can also help your veterinarian if there is a question about your horse’s health. Small changes in weight are normal, but larger changes in weight could indicate a problem with diet or a more concerning health issue. Inventory Medication for your horse. 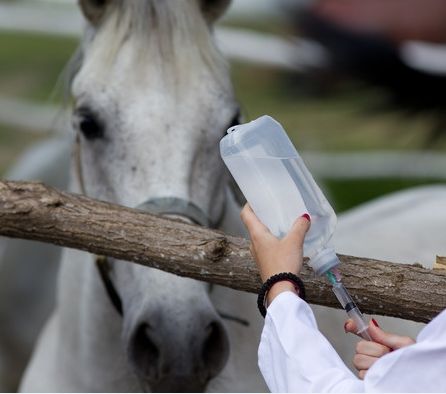 It is not uncommon for horse owners to keep medications on hand to treat various illnesses or injuries. However, it’s important to remember to inventory this medication occasionally to be sure none of it is expired or that your supplies are sufficient for your needs. Medications that are out of date may be less effective or completely ineffective, and the last thing you want is to plan on having a dosage and finding out that your supplies are depleted. Check regularly and reorder when needed. Keep Track of Dates & Appointments. It is easy to forget when a veterinary appointment is required or when a vaccine was administered. Keep track of this information in one place and make it easy to verify and to make sure your horse receives the appropriate treatments at the right time. A file folder system can be used to store paper records if you prefer, or there are many digital calendars and data management utilities available today that can track past treatments and visits as well as remind you of upcoming appointment or vaccine booster shots that may be needed. Stay current on events affecting horses. Trying to keep up to date on the latest outbreak or horse health concern can feel like an impossible task. Fortunately, the Internet has made this task easier. The U.S. Department of Agriculture and many state agriculture departments publish notices about infectious diseases and other important information for animal owners. Some sites offer email updates or social media postings to make it easier to stay current on this important information or to see any pressing emergency announcements or concerns. Provide safe Structures & Barns for your horses. Your horse probably spends a lot of time in the barn, at least during parts of each year. Make sure the barn or shed where your horse spends time is safe and sturdy. Look for sharp edges, broken or damaged doors and windows, and uneven or damaged floors. A well-designed and carefully-constructed horse barn can help to keep your animals safe. Deer Creek Structures has been offering quality horse barns since 2005. The quality construction of our horse barns means you can trust on many years of dependable shelter for your animals. Contact us today by calling 254-546-2276 to learn more about our ranch buildings.